The Machaca Hill Lodge is host to numerous natural and cultural adventures including nature trails, a river and two streams, foothills and mountains, abundant birds, colorful butterflies and exotic wildlife, old-growth Rainforest and a Mayan burial site. Machaca Hill is located in the undiscovered paradise of the Toledo District in southern Belize and offers an elegant rainforest experience in a secluded region just 5 miles north of Punta Gorda town. This wonderful property offers some of the best fly-fishing in Central America. 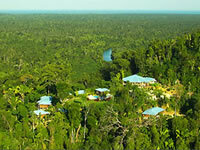 The lodge enjoys panoramic views of the Caribbean Sea and the rainforest canopy. From here, one can look east and see Honduras and Guatemala across the Caribbean Sea or turn westward to the majestic Maya Mountains of Belize. The Machaca Hill Lodge has 12 magnificently appointed individual cabanas terraced above a jungle hillside atop the Rio Grande. Each spacious cabana is furnished with two queen size beds, a sitting area including a day bed, private bath with hand made ceramic tile, luggage storage and rod holders. The cabanas are equipped with all the amenities including air-conditioning and ceiling fans. Each cabana comes with its own private veranda overlooking the brilliant vistas of vast jungle reserves and the wildlife corridor.